Here’s the best I can do at the moment. It’s a pretty skimpy map, but at least it includes the major sites: the Old Synagogue, the Jewish cemetery, and the two present-day monuments. I knew I had to be better prepared for my second trip to Skuodas than I was for my first, but I had no idea how to go about it. Planning accommodations and Jewish history tours in the other family hometowns I wanted to visit, Riga, Liepaja, and Kaunas, was easy, as I have a cousin in Latvia who speaks English and is well-connected with the local Jewish community, and the hotels in the larger centres have informative websites and online booking. Skuodas was a different matter. In the year since my first visit in 2007, I’d managed to find some general information about the town online, but still had no “in.” Emails I sent to the city administration were not answered, probably due to the language barrier. One of my Google searches turned up an online English-language resume of a former Skuodas resident. I emailed her, and she kindly put me in touch with an English-speaking friend of hers who lived in another town but visited her parents in Skuodas regularly. Skaidre, the friend, was more than willing to help. She set up an appointment with me to meet one of the coordinators of the Skuodas Museum, Joana Sleiniene, and a retired teacher and translator, Roma Zemaitiene. 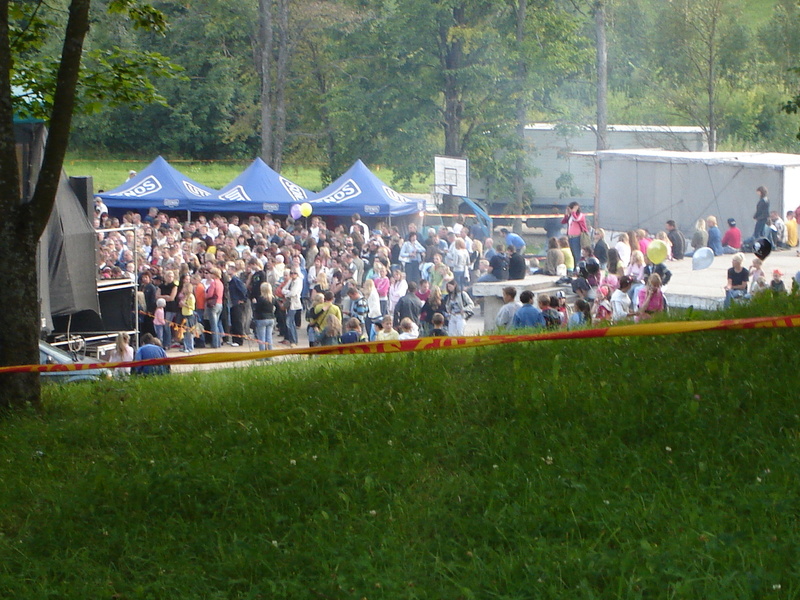 So, on a hot July morning, my travelling companion and I left Liepaja in our rented car, and – avoiding the back roads this time – arrived at the Skuodas Museum to find Joana, a tall, solid-looking woman a few years older than I, and Roma, smaller and grey-haired, waiting for us. Then we set off for the tour Joana had planned for us. Just outside the museum, we stopped for a photo op. “Make us famous,” Roma joked, and I promised I’d try. 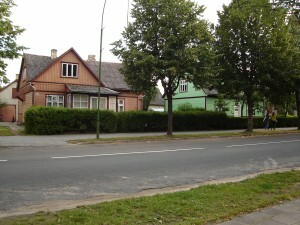 Still on the museum’s doorstep, Joana pointed out a modest, blue-painted house across the street. 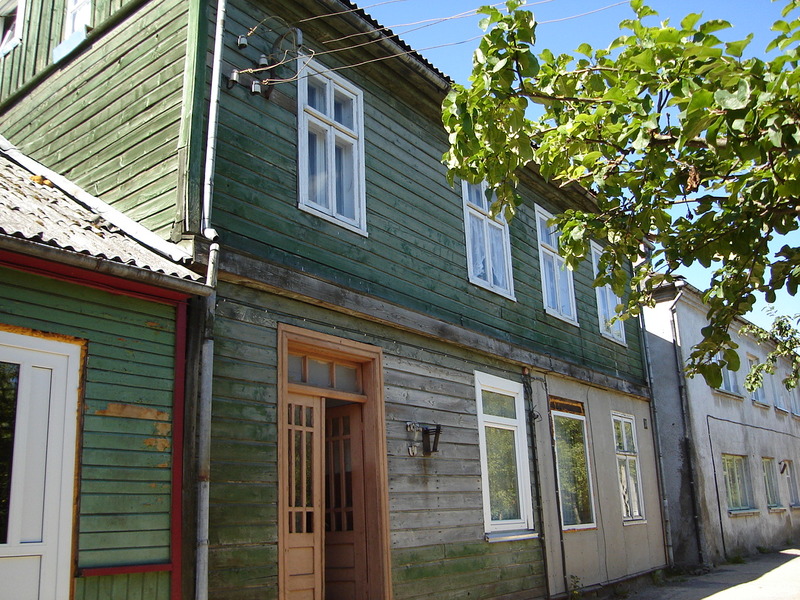 This was one of the few remaining Jewish houses on Laisves Street, once home to a largely Jewish population. 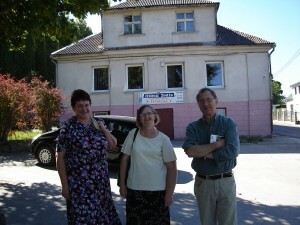 A few minutes’ drive away, we pulled up at another surviving Jewish house, this one belonging to the Mayer family. [I thought at the time it was my grandfather Mayer Mines’s house, and was tremendously excited until I realized my mistake.] This is one of the only Jewish houses in the area to have survived the town centre’s destruction in WWII, and it is still in use. The well from which the Mayer family drew water is still in the courtyard. Then we drove to the monuments. 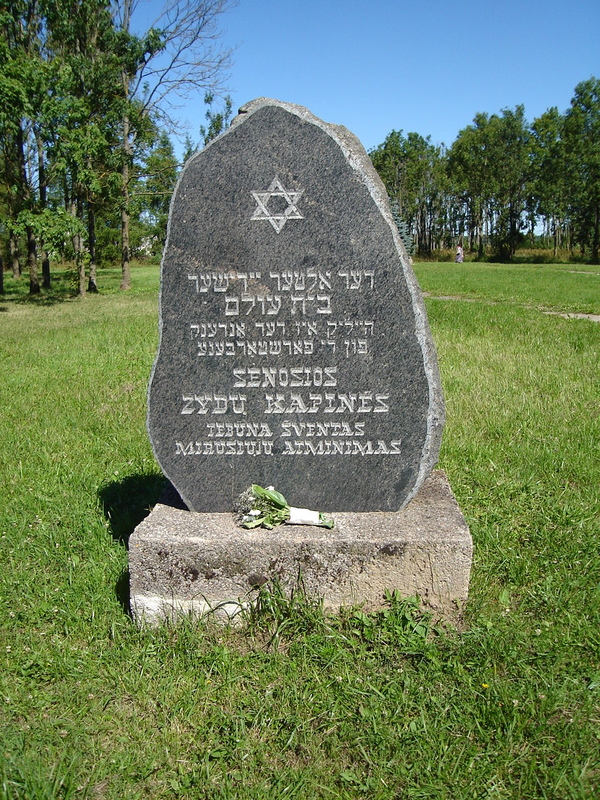 First, the Jewish cemetery, which was destroyed by the Soviets after World War II, the tombstones carted away for various building projects. 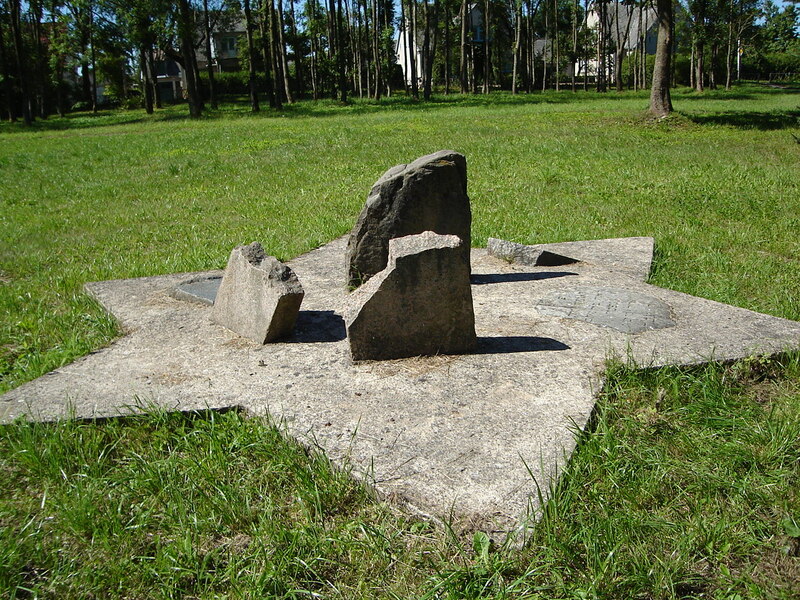 All that remains is a flat cement base, shaped like a Star of David, into which have been set a few largish upright chunks, fragments of tombstones still bearing their Hebrew lettering. I had brought a few pebbles from home, and I placed one on the monument, picking up a few pebbles to put on my father’s grave at home. Aside from the missing tombstones, the cemetery is well-tended: grass cut, litter-free, peaceful. 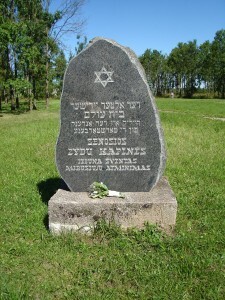 A tall standing stone by the entrance identifies the place in Yiddish letters. A stork nests in a tall tree overlooking the empty field. Next we drove to Kulai I, the site of the Nazi massacre of most of the Jewish men of Shkud, an abandoned gravel quarry a few miles out of town. [At the time, I didn’t know about Alka Hill, where most of the women and children were murdered, which I plan to visit next time I’m in Skuodas.] Now, the former murder site is a peaceful place in the sun, guarded with trees, freckled with Queen Anne’s Lace and other wildflowers, overlooking a small blue lake with black and white cattle grazing nearby. The monument lies at the end of the road. 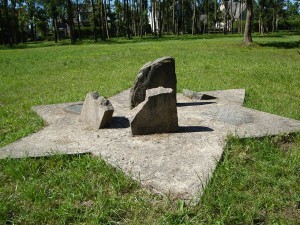 It features a large rock with a flat, polished face, set upright on a concrete base. The rock has been split in two, like the tablets of the Ten Commandments, its two halves joined by a Star of David fashioned of thin metal strips. On each tablet is an inscription, one in Lithuanian, one in Yiddish, honouring the 800 Jewish citizens of Shkud, some of whom were my relatives, who were killed by gunfire at that place. “The wound,” it reads, “will never be healed.” (“The words are quite, quite true,” Roma added.) 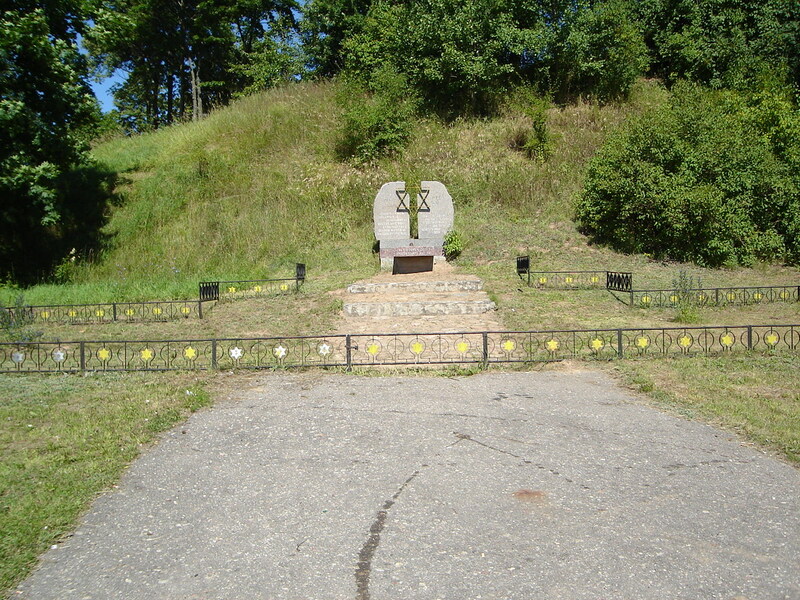 The site is surrounded by a low metal fence inset with yellow-painted Stars of David. I hesitated for a few moments to step over the fence and approach the monument, but then I reasoned it’s my own people’s place. I stepped over the fence. I placed a few pebbles from home at the base of the monument. I took a few away with me, for my father’s grave. Then Joana, through Roma, told us a story. She was, she said, in the 8th form. It was 1963. 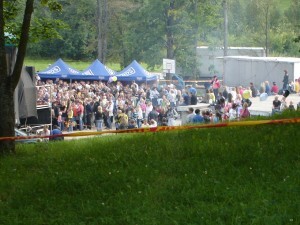 There was a ceremony organized by the municipality. All the bodies from Kulai were put into coffins and brought into town. There was a procession with flowers at the head, then the coffins carried by the people of Skuodas, then some more of the people of Skuodas on foot. Schoolchildren sang songs. Some of them had even learned some Jewish songs and poems. 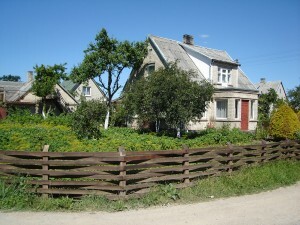 In those days several Jews still lived in Skuodas, and other Jews, relatives and other people, had been invited, and they also participated in the procession. They brought all the bodies into town and buried them there. We drove back to the town, passing on the way the site of the Old Synagogue, now a potato field. 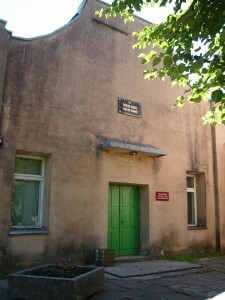 In the town centre near the museum, behind the tidy rows of houses and their vegetable gardens, at the end of an alleyway of privet hedge, and next to the Shaul Hall, where Jews and other prisoners were held and tortured before execution, lies the final resting place of the Jews who were massacred in Shkud and Kulai. The monument is a square cube of reddish granite, polished to a high gloss. 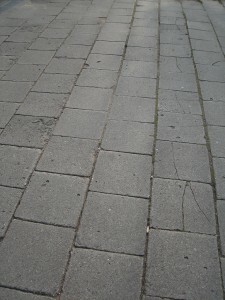 One corner is set into a flat, circular concrete-and-stone base. It is surrounded by six smaller triangular blocks. I suspect that, viewed from above, the cube and triangles would form a Star of David. 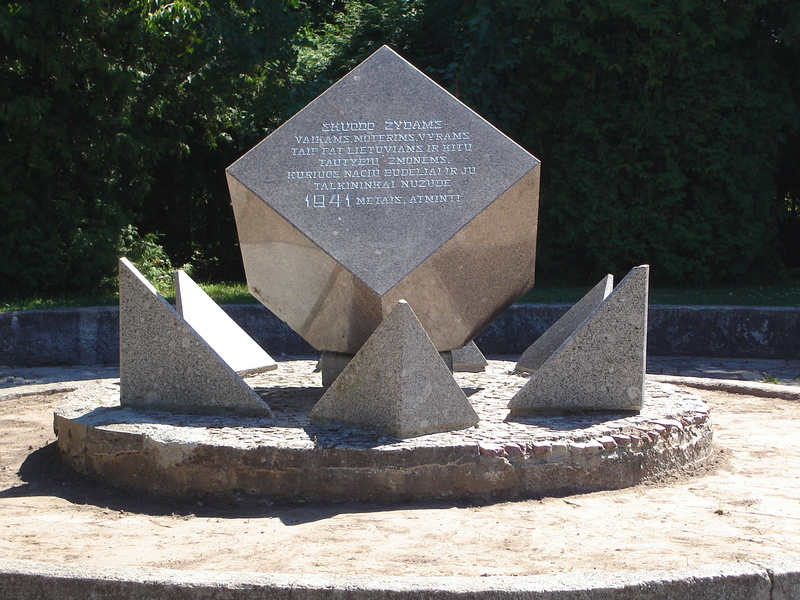 In the circular base of the monument are set numerous shards and fragments. Joana said they were the remains of tombstones from the destroyed Jewish cemetery. One side of the granite cube contains lettering. 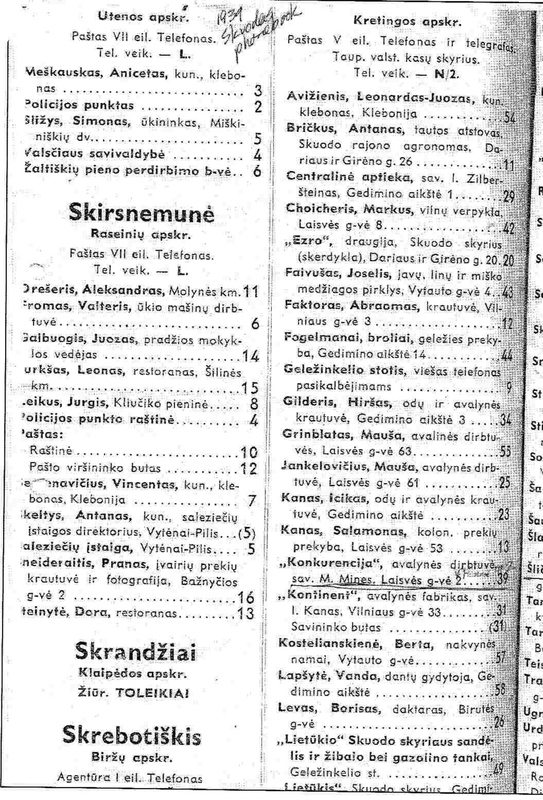 The words are Lithuanian, but the letters, square and blocky, with fat pointed serifs, suggest Hebrew. Roma translated: “To commemorate Skuodas Jews – children, women, and men – and also those of other nationalities who were killed by Nazis and their collaborators in 1941.” I stood for a long time. A thin grey cat sauntered across the monument’s base. I left a pebble. I took another. Back in the museum, I felt overcome, bombarded with emotional overload. We had been in Skuodas three hours, and I felt I needed three or four days to digest everything. Joana showed me some cases displaying items manufactured by Skuodas Jews, and I dutifully snapped a few photos, but by that point I was taking in very little. It was only a few hours ago, drafting this blog, that I realized one photo featured postcards made in the printshop belonging to the Davidov family. That is a name I now recognize as one of the prominent families of Shkud. Before we left, I gave Joana a couple of photos of my father and his family in Shkud for the museum archive. On my next visit, I found them prominently displayed in a case devoted to the history of Jewish Skuodas. But that’s another story. 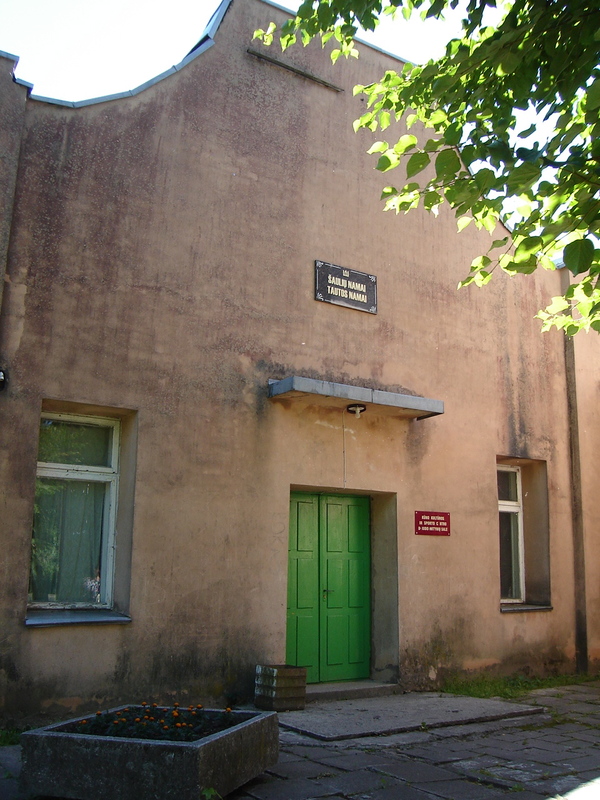 I’ve just received permission from the Skuodas Museum to post about 45 pages of archival material, both in Lithuanian and English translation, on Shtetl Shkud. 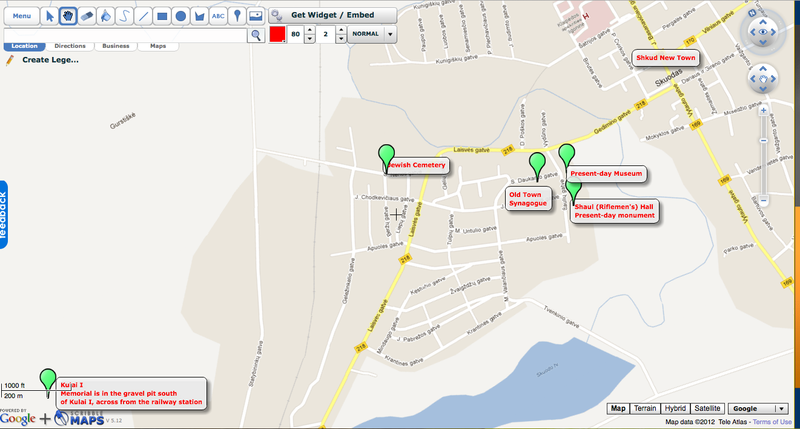 I’m really excited about this, because the information is not available anywhere else. The file contains descriptions of Shkud, memoirs, and interviews with older, non-Jewish Skuodas residents who remember the Shkud of their childhoods. There is also a memoir written by Boris Fogelman, a Jewish Shkudder who was deported by the Soviets just before the German occupation and returned to Lithuania in 1979. In short, it’s a Yizkor book compiled by Gentiles in memory of their Jewish community, and I think it’s quite a treasure. 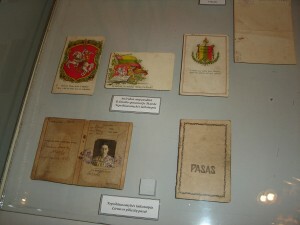 I hope to post the archive in English within the next week or so, the Lithuanian originals to follow. 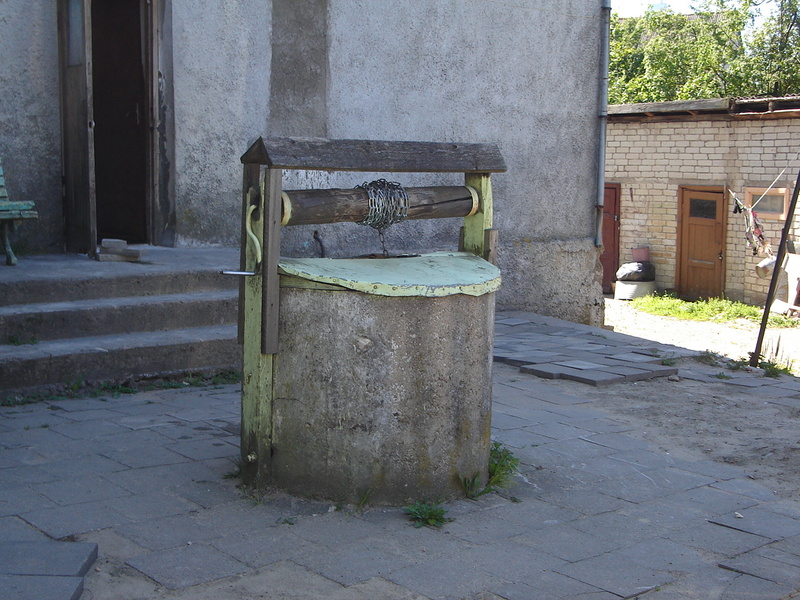 Welcome to the Shtetl Shkud blog. 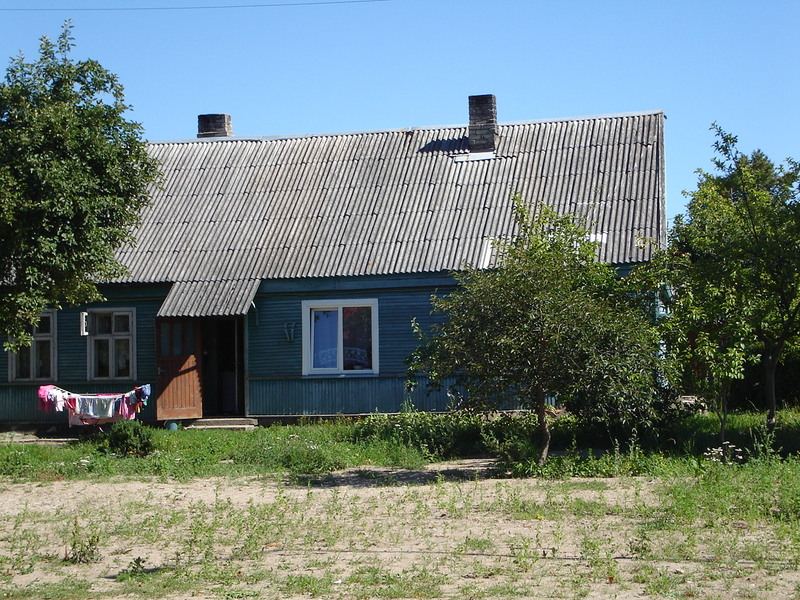 My plan is to use this blog to share our stories, memories, and thoughts about Shkud, our families in Shkud, and present-day Lithuania and Skuodas. My relationship with Shkud began when I was a kid, when I first saw my dad’s Yizkor book, and in it, a photo of him as a young man with his football team. To me, at the time, the book was like a puzzle with no entranceway: a language I couldn’t read, black-and-white photos of people I couldn’t identify, and a town “behind the Iron Curtain” no one could get to. My parents, both survivors (my mom, a Canadian citizen by birth, grew up in Liepaja, Latvia – but that’s another story) told me that all Jewish documents and records had been destroyed in the Holocaust, and that, as I thought, was that. Fast forward … my dad died in 1982. Lithuanian independence and the Internet arrived about a decade later, but it wasn’t until 2007 that my brother and I had the brilliant idea to find our “roots” in Eastern Europe. 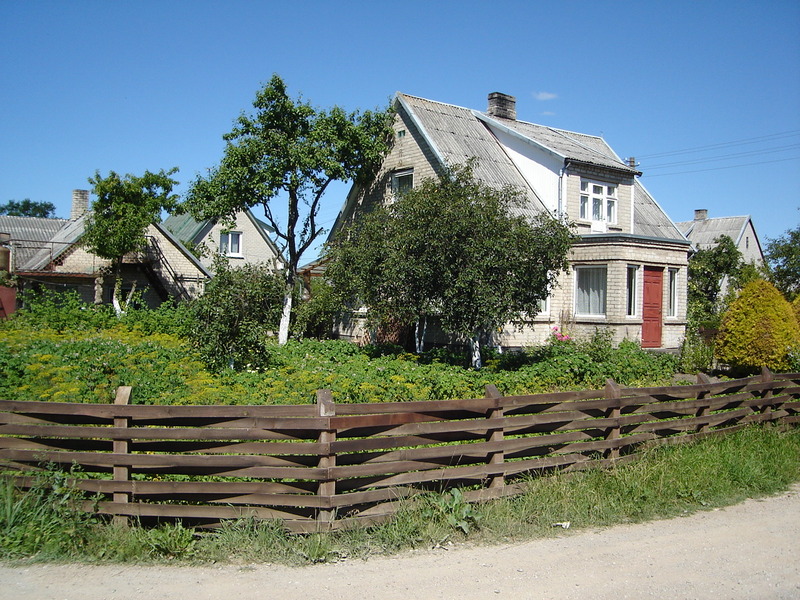 Our mom’s hometown, Liepaja, Latvia, was our main port of call, since my mom still had a cousin there, and also, we’d been able to discover quite a bit about Liepaja online. But very little information about Skuodas was available to us – we were thrilled just to be able to find it on a map, a half-hour drive from Liepaja, just across the Latvia-Lithuania border. Our first attempt, a “shortcut” across farmland on secondary roads, proved unsuccessful. After a brief encounter with a couple of Latvian backwoodsmen, neither of whom could interpret our English, our handwaving or, apparently, our map, we found ourselves on an ever-narrowing lane which eventually devolved to a rutted track through the underbrush, then ended in a swamp. Their six words of English: "This is my brother! He's crazy!" Back in Liepaja, we recovered over drinks in our hotel and tried again. This time, we got it right, and after a 10-minute wait at the then-manned border station just north of Skuodas where our passports were checked (paranoically, I half-expected a Lithuanian version of “Jews! Out of the car!” but of course nothing happened), we were in Skuodas. We had no idea what to expect. For all my online research, I’d found very little information, and some of that obviously wrong (“Its territory covers 911 square meters.”). The night before, raking over our memories of the bits and pieces our parents had told us about the place, I’d observed to my brother, “no matter what we expect, for sure it’ll be completely different,” and it was. 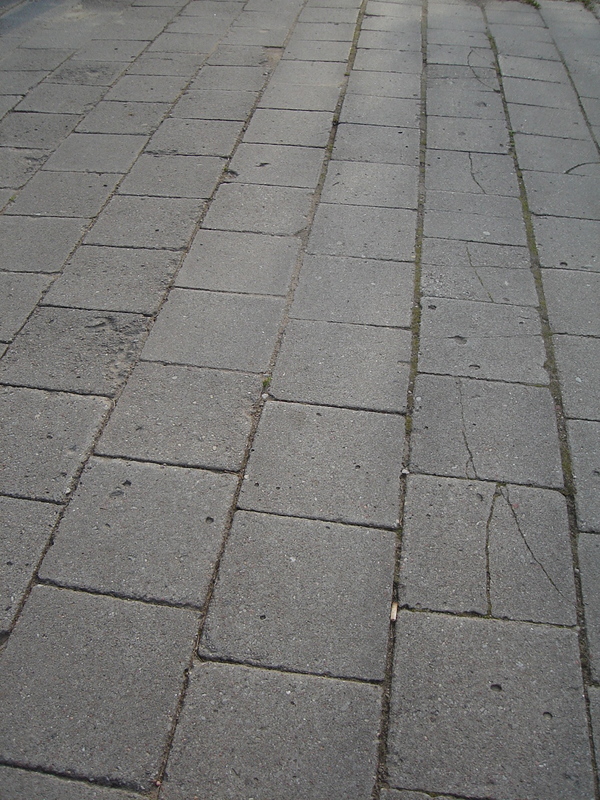 For one thing, my mom used to tease my dad about Skuodas’s wooden sidewalks. For another, she used to tease him about the goats eating the thatched roofs. What we did find was a quiet town of tree-lined streets, modestly prosperous-looking houses and public buildings, a surprisingly modern town centre that could have been anywhere in North America (“with a bank machine! and a supermarket!” we marvelled), and a populace enthusiastically attending that evening’s pop concert in a beautiful wooded riverside park. I guess what really struck us was how ordinary the place was, and the gap of decades and cultures between the Skuodas of today and that of our parents’ and grandparents’ generation. 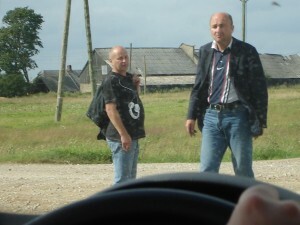 We drove around for a while, trying to feel a connection, to put ourselves and our father into the place, and then we went back to Liepaja. The next summer, I returned to Skuodas. In the meantime, I’d managed to find out a little more about the town and its history, though there still wasn’t much information available. Even better, I’d made online contact with a resident who very kindly arranged for me to meet Joana Sleiniene, a director of the Skuodas Museum. So, on a hot morning in July, 2008, Gene (my travelling companion) and I left Liepaja and headed to our appointment in Skuodas.